In December 2013, AdType was awarded Google Partners badge for the level of digital marketing services provided in Paid Search and Display Advertising. A great achievement you might say! We agree but we couldn’t settle and we continued to work hard to be recognised as a Premier Google Partner – proving to us and our clients that the hard work and innovative thinking we apply to our AdWords strategies are ahead of the curve. 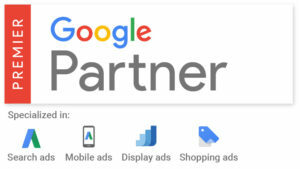 The Google Partners program brings together marketers, agencies and other digital consultants who want to get the most from their Google relationship. Approved members have exclusive access to many benefits and resources, like training programs, industry insights, promotional offers and beta opportunities. Certifications: Proving excellent use and knowledge of AdWords for both search and display. To fulfil this requirement a company must be affiliated with at least one person who is certified in AdWords. To get certified, an individual must pass at least two AdWords certification exams, including the Search Fundamentals Exam and one advanced exam. In our case, we are qualified for both – advanced search and display. Best practices: Demonstration that our clients’ performance is maximised by implementing recommended best practices in their accounts. Google regularly reviews the accounts to make sure our clients are getting excellent service, including the type and frequency of the changes we’re making, client retention, and whether we’re making the most of our clients’ budgets. Spend: Representing a healthy amount of activity by meeting the spend requirements across all managed accounts. On a monthly basis we manage over a £1M worth of AdWords search and display budgets for our clients. Company profile: Completed agency profile for Google Partners. Achieving Partner status is not supposed to be easy, which makes it even more rewarding to receive a badge. And to make sure we deliver on your search and marketing needs – we’ve earned a Bing certification too.